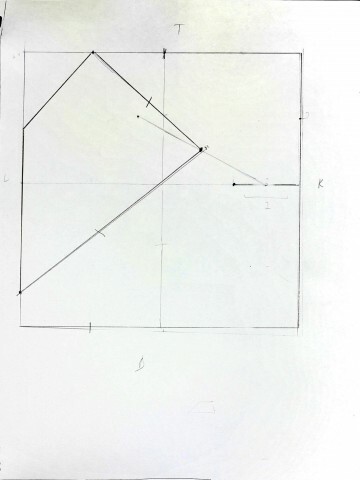 While creating my solution to Lewitt’s instructions I found that the instructions seemed to leave the drawing of the actual trapezoid open-ended. 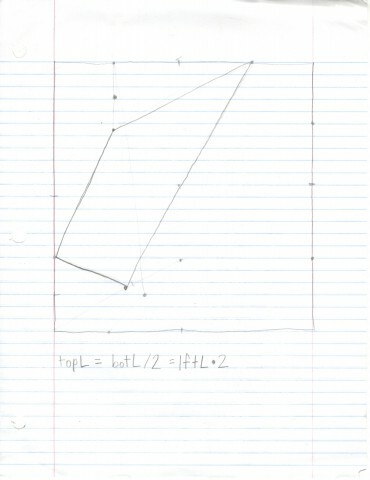 The size of the left and bottom have lengths defined relative to the top, but the perpendicular sides of the trapezoid are not defined. It is not known which side is located between the crossing of the first line with the second two. The trapezoid is also not defined to be an isosceles trapezoid. This leaves a large number and variation of solutions that should satisfy the instructions. It is possible that I misread somewhere along the line, but I feel I was fairly careful. I’d like to think that these drawings should exist only in word form, and not to be executed. This way, they are forced to be imagined and for the most part, fail as well due to the complexity of the instructions, and this dynamic appeals to me: describing an impossibly-imagined drawing. I think for the most part, this is very much like code, where I would play the part of a faulty computer. 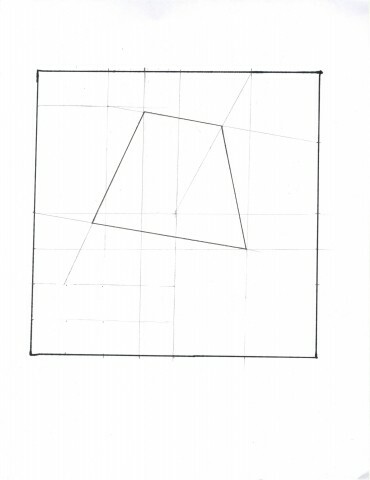 It was frustrating to follow, and even more frustrating to think about, and it makes me wonder if Lewitt drew the pictures beforehand, or wrote out a set of instructions and let someone else figure them out. 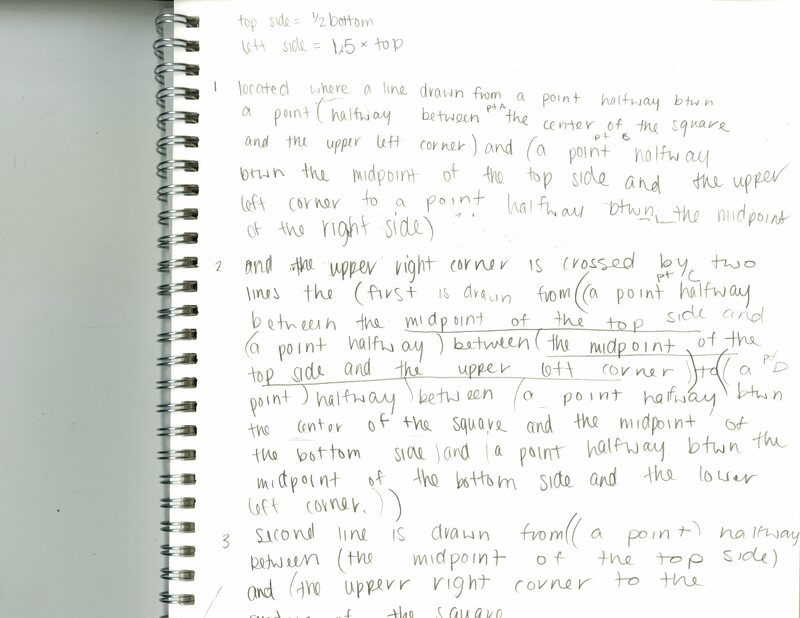 After teasing the raw list of instructions out all of Lewitt’s ambiguous description, I began using a technique similar to Melanie’s from last semester’s blog to organize the steps. Each object (line or point) described in the shape is identified by the line number it lies on. Each object can have “child” objects of which the location of the “parent” object is dependent on. 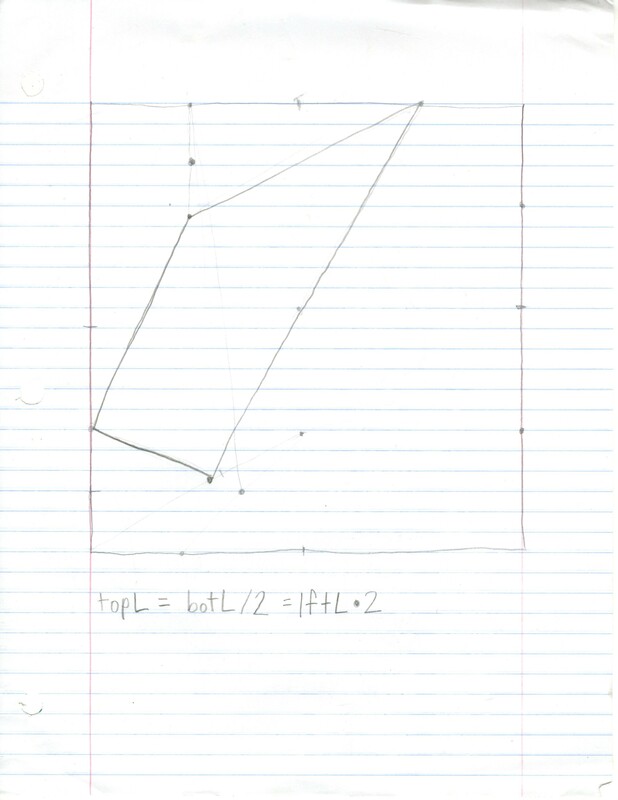 By using this method, the executor can start by drawing the top-level child objects and work their way down. 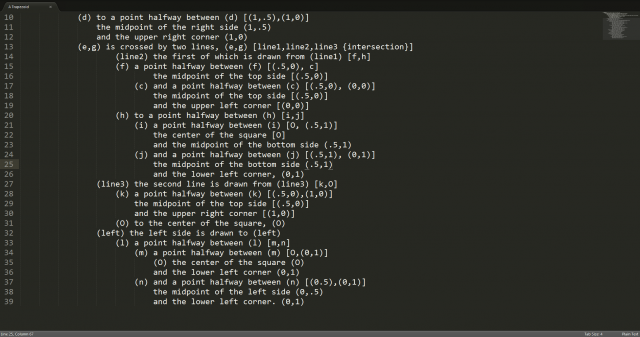 This technique seemed to work, but the structure was a bit strange – I was able to parse and and execute the instructions like code, but it felt as if I was working backwards through some weird nested functions. Machines are good at executing code structured in this way, but I think that humans are better at following instructions that are more intuitive and graphical. 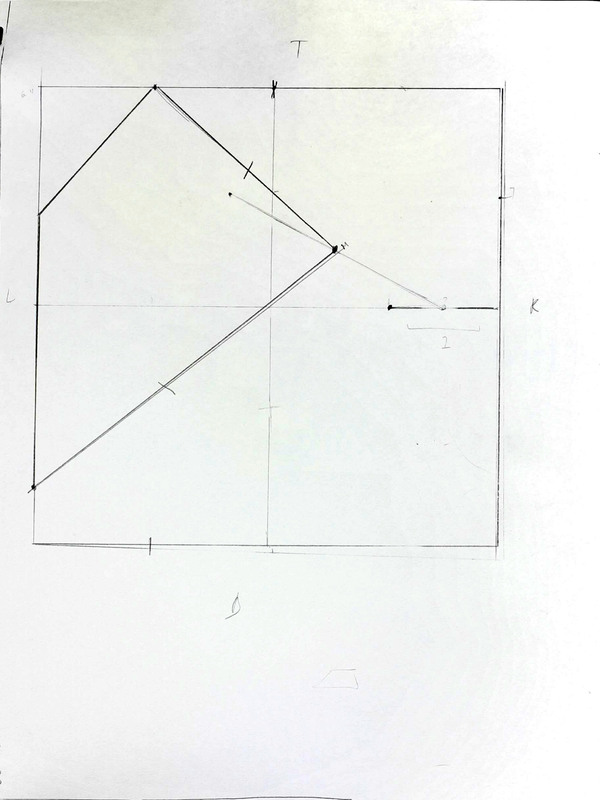 The structure I came up with to make it easier to draw Lewitt’s shape is basically a reversed version of Melanie’s method read right to left, starting from the most basic points and eventually converging into the lines and sides that describe the trapezoid. At this point, I noticed how code like this process was. Instruction – Evaluate – Instruction. 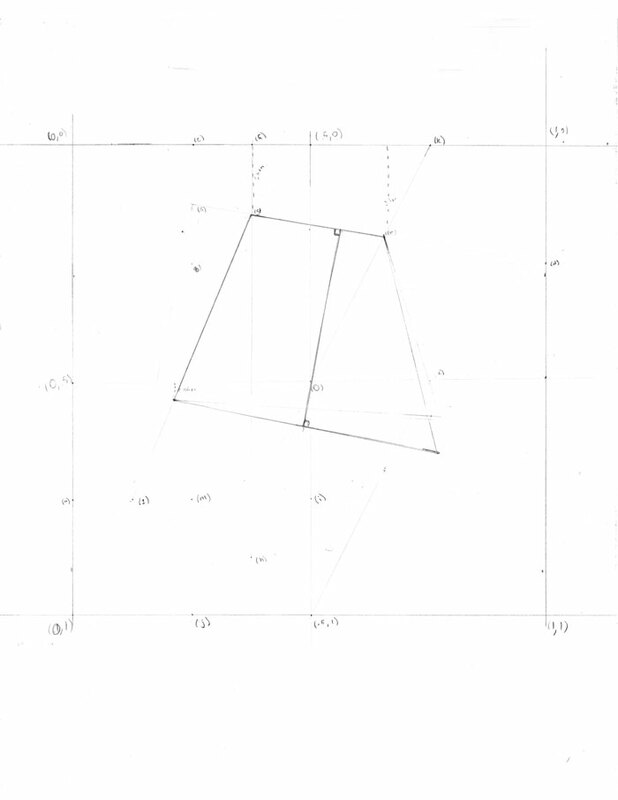 Before I organized Lewitt’s instructions it was not very code-like because of it’s ambiguity. 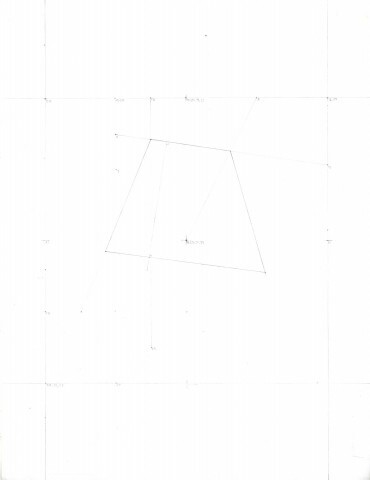 While there were some portions of the drawing which are still left to the imagination of the executor, after the organization it is much clearer as to how to go about the drawing. 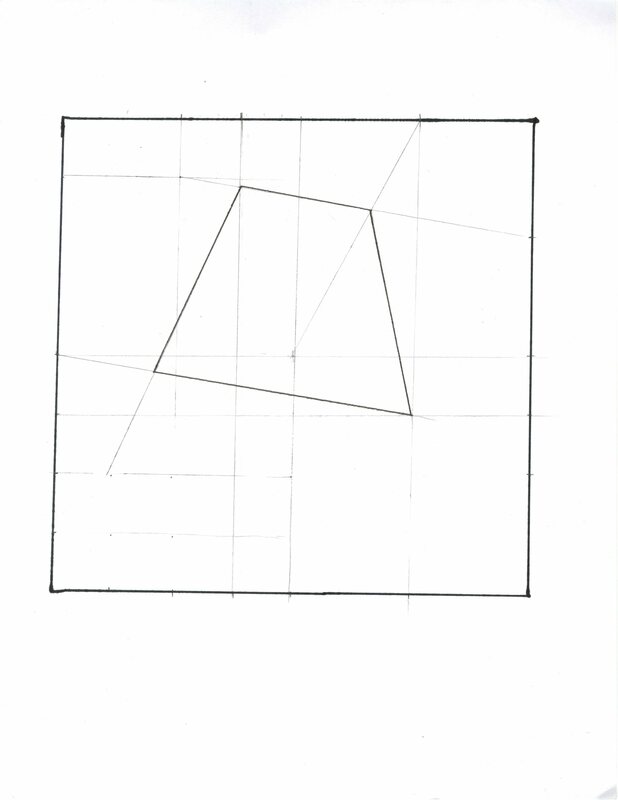 I think Lewitt’s Wall Drawing can be thought as a code in some perspectives. It is giving out instructions to the person who is executing it and it doesn’t differ even if somebody else draws it. It always need to have the same outcome just like code. Code doesn’t give you a different answer because you are a different person; it does the same for everyone. 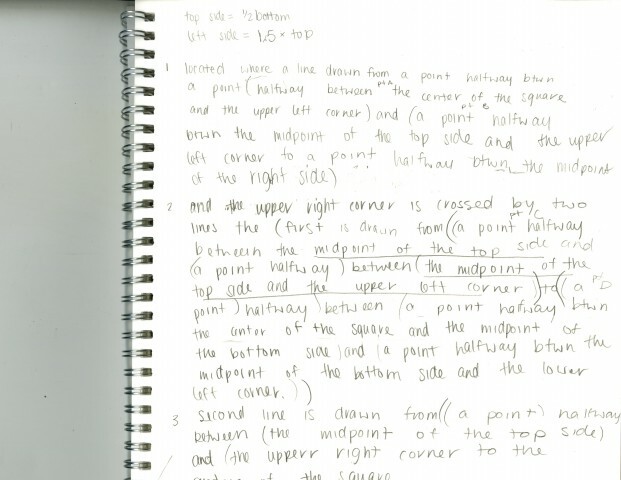 When I was executing it, the instruction itself was not difficult but the way that it was written was more confusing since all of the instruction was put into one sentence instead of trying to explain it short and clearly. It seemed more like a math question trying to figure where the dots and the lines goes to and connecting them together. I had hard time translating the long languages into instruction rather than the actual drawing itself. 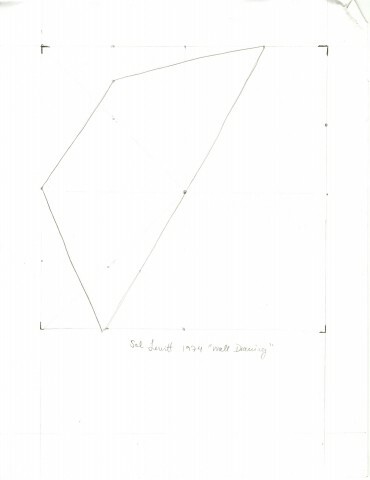 So back in the 70s, Sol Lewitt took great pleasure in torturing gallery assistants by ordering them to make his art for him. 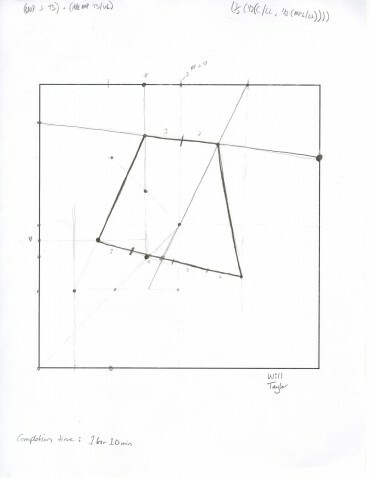 Not only this, but Lewitt found it necessary to give his commands in the form of one unintelligible run-on sentence. 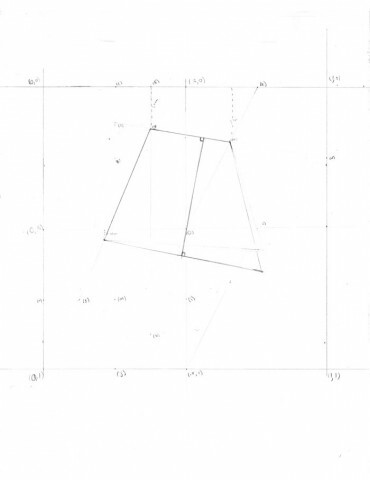 In one such wall of text, Lewitt instructs the creation of a trapezoid which follows a very specific set of proportions, given in his signature unintelligible babbling style. 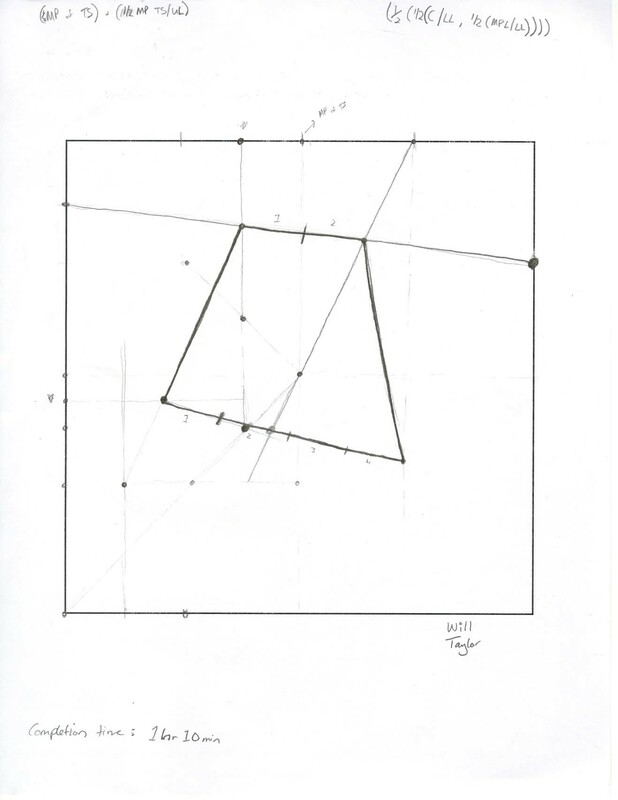 In order to understand Lewitt’s cryptic commands, I broke them down into mathematical equations, as seen below the drawing itself. I found this to be the most effective tactic for extracting useful properties of the trapezoid from sections of the sentence. 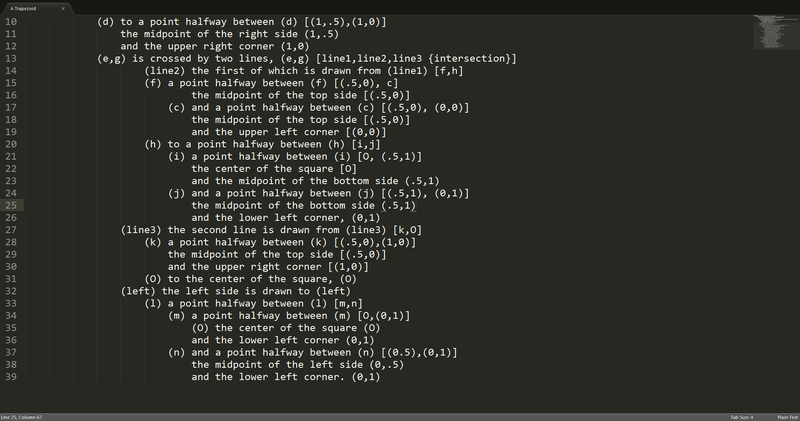 I don’t consider Levitt’s instructions to be code. 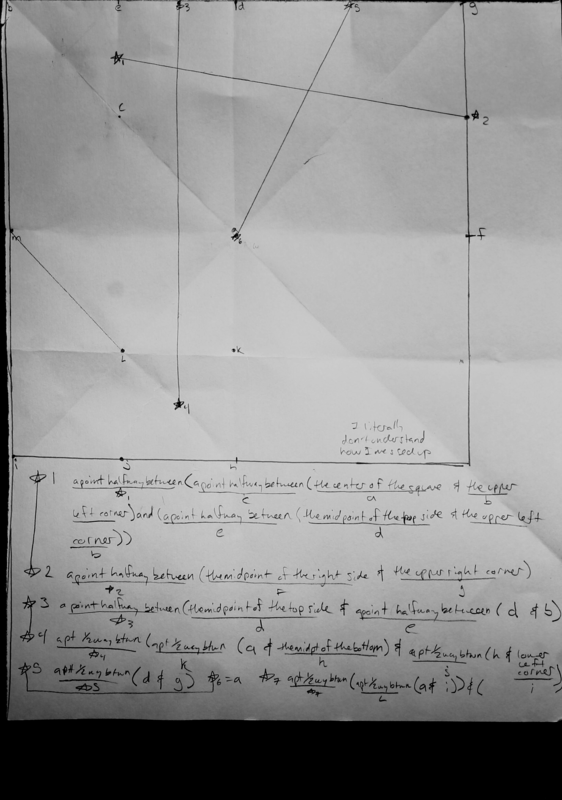 The first picture I posted is one page of notes in which I tried to apply code-like thinking in order to make sense of Lewitt’s directions. 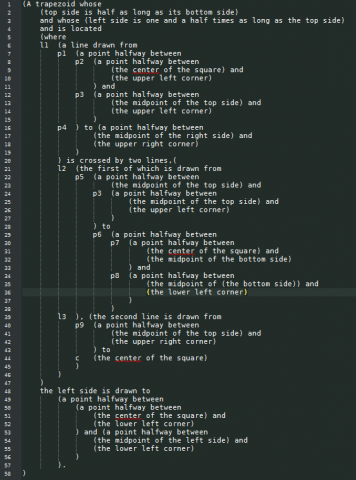 I feel that because his text seemed purposefully confusing this is not code. Good code, to me, is clear and written with the goal of consistent function. 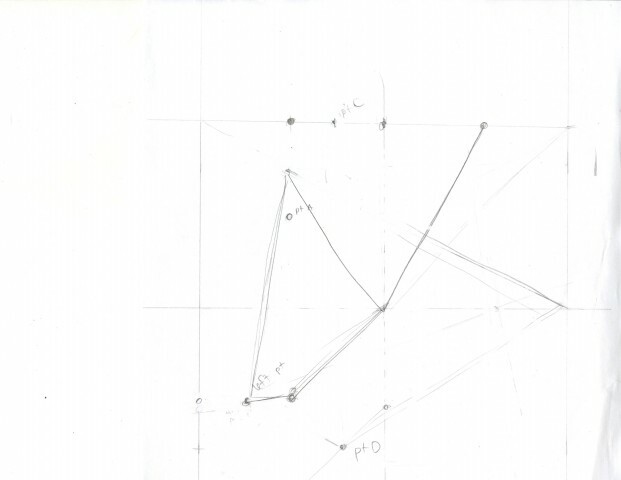 While following the instructions for the drawing, I found it very difficult to distinguish separate points in a single sentence. I think that these instructions could be considered code, but as code they’re very complex and difficult to understand. Especially if they are being given to a human to decipher. One thing that really helped me was breaking the sentences into expressions, as seen at the top of the page. 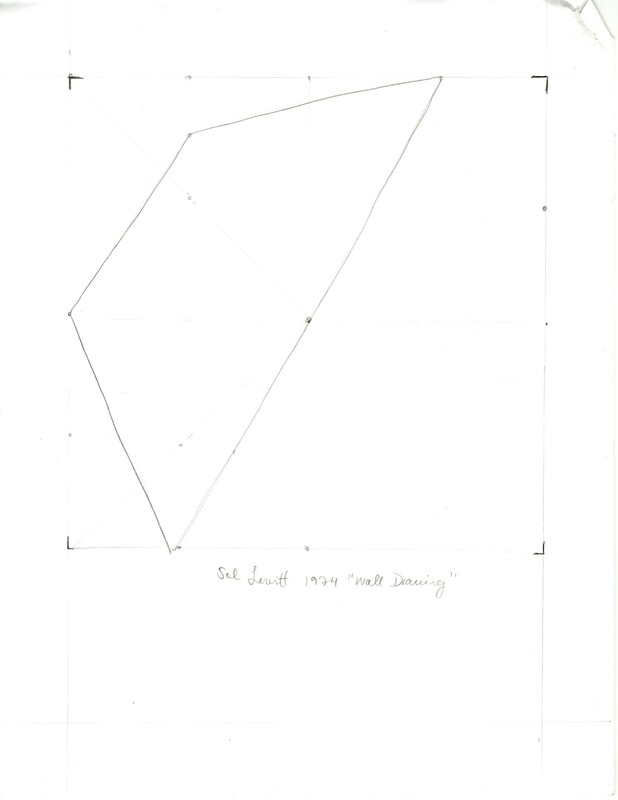 Attempting to execute the Â Sol Lewitt line drawing was almost as difficult as the whole elaborate instructions appeared, except not quite. Once I created a process in which I could tackle each point and then each line, I found that following the directions weren’t as hard as I initially anticipated it to be. I was able to do this by reformatting the way the directions were displayed. 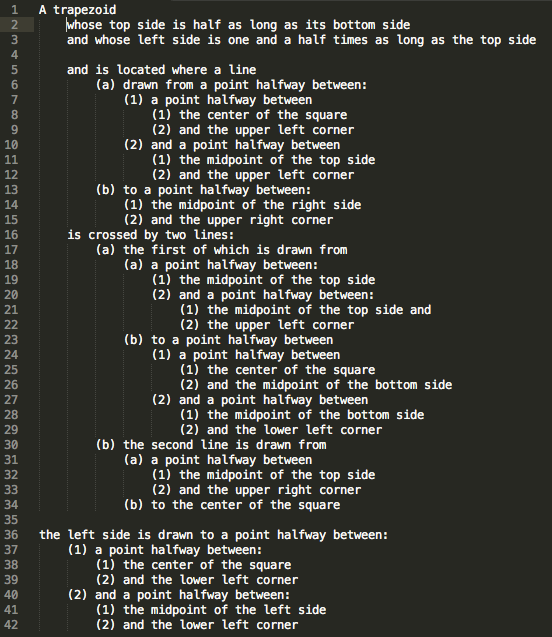 Where at first all the directions appeared in a mass of a paragraph, I separated each line from one point to the next and was able to follow the directions to a somewhat more manageable way. 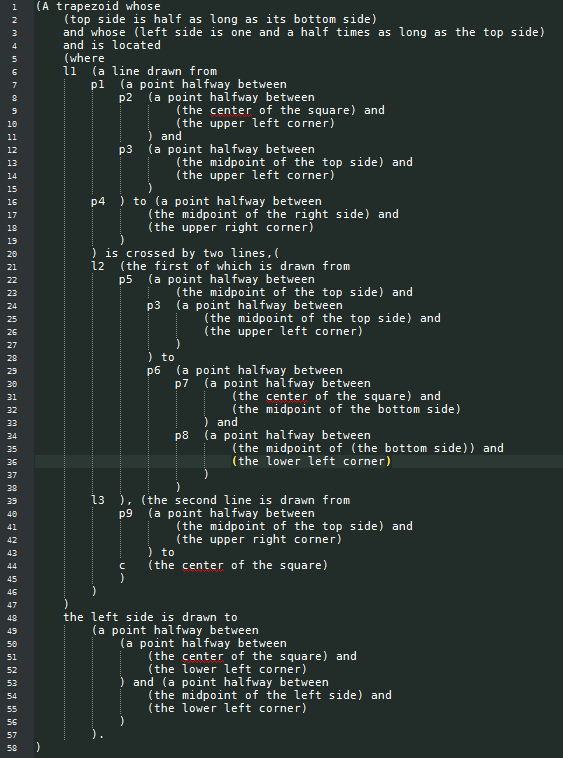 Making the instructions more visually succinct really helped make the drawing process a lot more manageable. 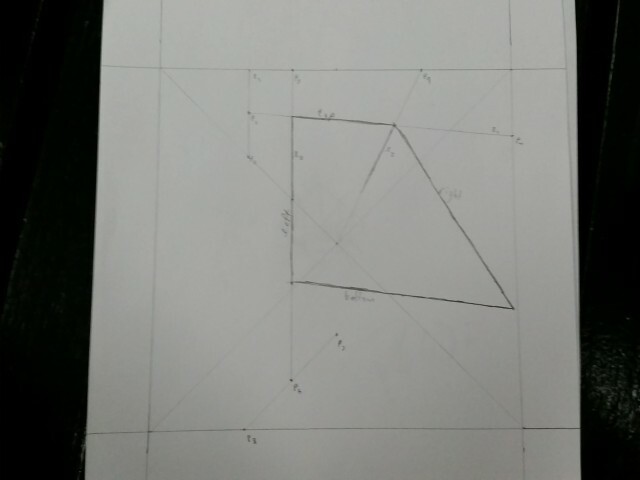 Even so, I’m not quite sure I succeeded in created the instructed trapezoid. 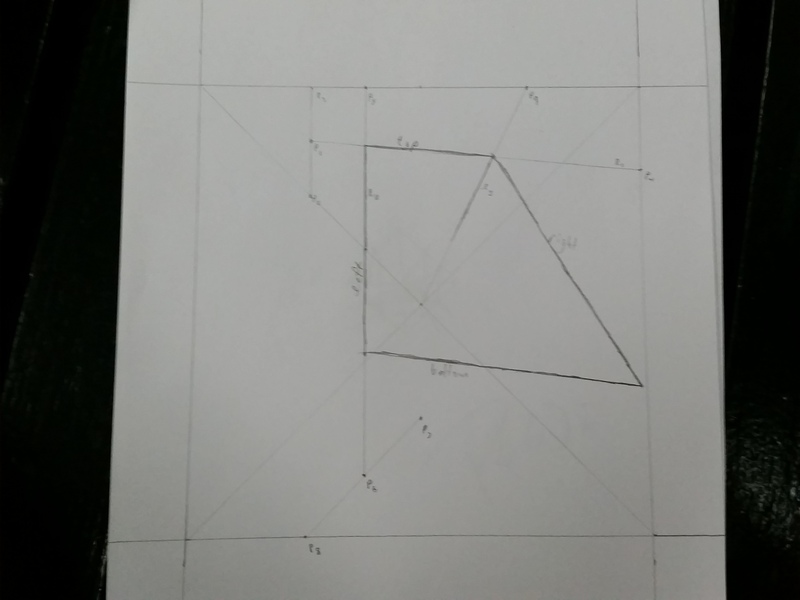 Below is an image of my completed trapezoid. 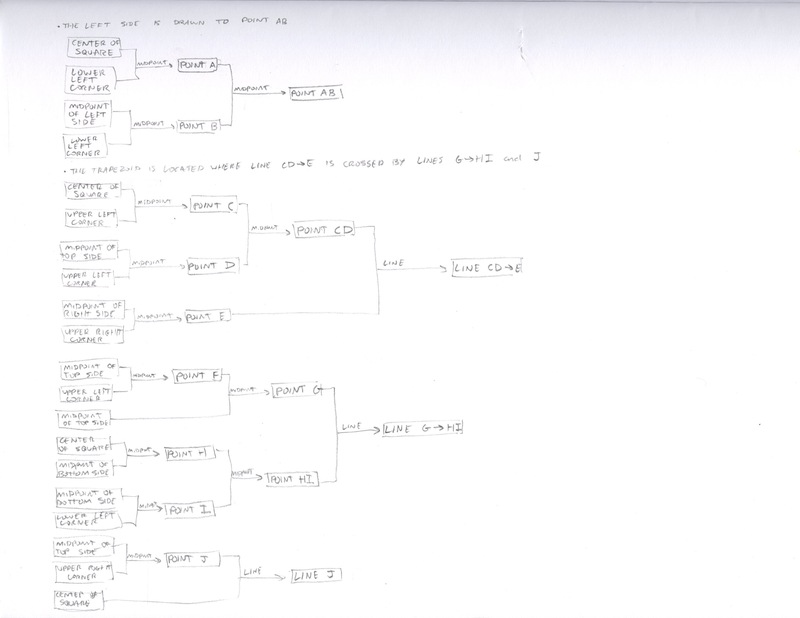 So the scanner in Hunt is absolutely a terrible idea but I don’t have time between classes to go and re-scan this. My experience executing this is that I felt great about it all the way up until the last step, at which point I realized I had screwed up Marjory somewhere along the way and couldn’t figure out how. My method for trying to execute it was to split each instruction up with parenthesis like a math equation so I would know what parts I had to do first to get to the point halfway between the point halfway between the whatever I had to do next, but I suppose I mis-parenthesis-ed or mistakenly separated or lumped together a few unrelated directions because it came out completely weird and I can’t figure out why. Also probably folding the paper to make my guidelines wasn’t a good idea in the long run either.